THE recent suspension of Russia from the G8 club of rich countries has been described as “no big deal” by the President Vladimir Putin led administration. The group of leaders retaliated for Putin’s annexation of Ukraine’s region of Crimea by agreeing to exclude Russia from their meetings. United States of America’s President, Barack Obama joined David Cameron and the leaders of France, Germany, Canada, Italy and Japan to impose the penalty. Russian Foreign Minister Sergey Lavrov said G8 is an informal organisation that does not give out any membership cards and, by its definition, cannot remove anyone. According to him, all the economic and financial questions are decided in G20, and G8 has the purpose of existence as the forum of dialogue between the leading Western countries and Russia. Until then, the G8 is effectively suspended and the world’s richest countries will meet as the G7. Their main fear is that Mr. Putin will move beyond Crimea and invade eastern Ukraine. The latest diplomatic efforts are designed to deter Russia from taking this step. As it is now, Ukraine is beset by political turmoil the likes of which it hasn’t seen in almost a decade and the lessons for African countries such as Nigeria and Cameroun can’t be under estimate. What started as protests over the handling of a trade pact with the European Union escalated to the ousting of the pro-Russian President, Viktor Yanukovych. A new government has been installed in Kiev, the capital. Ukraine, the biggest frontier nation separating Russia and the European Union, is sometimes considered a pawn between Russia and the West. Ukrainian is the official language, spoken by 70 per cent of the country’s population. Russian is also spoken widely and is the mother tongue of many Ukrainians, especially in the east and in the southern region of Crimea, where ethnic Russians are in the majority. Violent protests broke out in the Crimean capital of Simferopol on February 27, against the new order set in motion a week earlier amid mass demonstrations in the country capital of Kiev. Crimea is a bastion of support for ousted President Yanukovych and is also home to Russia’s Black Sea naval fleet, based at Sevastopol. Coming back home, there is no doubting that Western influence is waning across the globe. For us in Africa, the Western World has had a huge impact on the continent and culture of Africa. This impact has been neither dominantly positive nor negative, but it is clear what the Western World should accomplish in the future in respect to Africa. The Western World has done some good things for Africa. One of the most obvious things the west has done to help Africa, is aid. The American public has been in overwhelming favour to help aid and educate Africa, especially on their HIV/AIDS crisis. Unfortunately, when Westerners whine about the growing Chinese influence in Africa they hardly realise how patronising it feels. They seem to be implying that Africa is theirs and the Chinese have no business trespassing into territory that supposedly falls within their sphere of geopolitical influence. My view is that Africa belongs neither to the Chinese nor to the West. Africa belongs to Africans. It would be unfair to overlook the positive contributions that Europe and America have made to Africa’s development. Ours has been a complicated relationship rooted in the bitter experiences of slavery and colonialism. Africans are unlikely to forget in a hurry the crimes that the West has committed against our continent. Up until recent times, western powers propped up murderous tyrants under the pretext of supporting Cold-War allies. They sponsored coups and counter-coups and plotted to unleash devastating civil wars on entire nations. In Angola, the U.S. fomented a vicious 27-year long civil war (Africa’s longest war) which ended in April 2002. The conflict killed 500,000 people and shattered the country. Three and a half million Angolans (a third of the population) were displaced by the war and up to 15 million land mines covered Angola’s arable land, making agriculture hazardous. As a result, fertile Angola has had to import half its food requirements and 82 per cent of Angolans lived in poverty. Like the Congo, Angola is rich in mineral wealth, being Africa’s second largest oil producer. scholars, diplomats, military officers, civil society actors as well as university students were gathered. The lecture, entitled, “A Hegemony in a Peripheral Region of the World: The Future of Nigeria’s Foreign Policy” provided analytical, historical and hands-on assessments of our foreign policy, with a view to overhauling it. Extremely interesting is the question raised slyly by Osuntokun as to whether Nigeria is a hegemony on its own behalf or on behalf of western military and economic power. He alludes to Nigeria’s intervention in Cote d’Ivoire and more recently Mali in which French interests were barely disguised as well as our support for a western-led effort to remove Gaddafi. In his words: “A situation where a former colonial power intervenes to remove a sitting African President and with Nigeria being complicit in this removal raises a fundamental question in one’s mind”. This is to say that we need to think through our policy options with a view to reasserting our national identity and leeway, rather than merely acting out scripts authored in London, Paris or Washington. Philosophers have long identified the problems in the world. The problem is how and who (especially) will change the world. 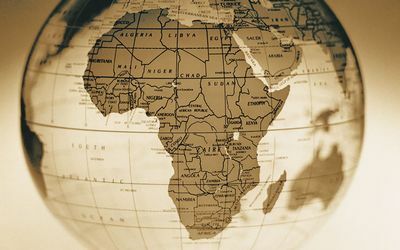 For decades now, African scholars have lamented the unequal relations between Africa and the West. Time has come for Africans to take their destiny in their hands, by all means possible and in all ramifications. Lamentations have not taken us anywhere, and will probably, not take us to any place. Positive action at breaking this uneven yoke may probably help! Cuba would probably be in the shoes of Africa today if Che Guvera, Fidel Castro, etc., did not take positive action to advance their society. The same applies to China, Russia, North Korea, etc. The crisis all over the world should be treated urgently and in an adequate manner by the world society. This could give the opportunity to minimise the quantity of victims amid civilians and to prevent the illegal overthrow of governments in such countries like CAR, Nigeria, and Ukraine. Persons who are responsible for organisation of coup-d’états must be prosecuted according to the international and local laws. In the frameworks of the activity to bring security to the West African region Nigeria used its military potential abroad. For example, Nigerian military force helped Sierra-Leone in fighting separatists. Also peacekeepers from Nigeria took part in stabilisation of the situation in Liberia. The interference of Nigerian force in the conflict management gave the opportunity to prevent strengthening of the crisis there and to avoid mass killings of peaceful people in that states. According to the international analysts, the actual situation in Ukraine on many points coincides with the African crisis, which happened earlier. As a result of a coup-d’états and rebellion there is a real threat to the Ukrainian civilians who support the legal authorities. All the government structures including Special Forces which should maintain peace and order are paralysed. On this basis Russian authorities, which aim to protect Russian citizen there and Ukrainians protesting against illegal coup-d’états and further deepening of the crisis, take some measures to settle the conflict in Ukraine as soon as possible. Nigeria had the situation with Bakassi like Russia with Crimea. Now Bakassi is territory of Cameroun. But there are a lot of Nigerians and it’s possible that in the future Nigeria will get Bakassi back. •Makinde is Lagos-based public analyst.